The Utah Jazz won easy promotion to the First Division by cruising through the Second Division as its champion for 2017-18. 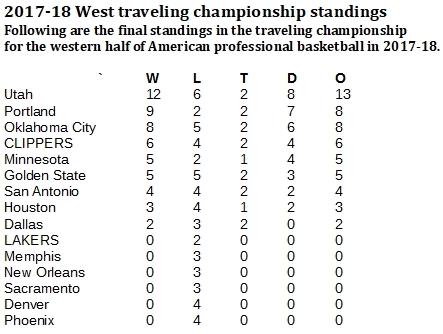 The Golden State Warriors are slowing down a bit in the western pro basketball traveling championship, but they're going to have to be real slow for a real long time before anyone catches them. Though the Warriors won only five western title games on the 2017-18 slate, they remain the runaway leader in this competition historically. The Warriors now have 38 wins through three full years of the chase, well ahead of the second-place Oklahoma City Thunder with 21. 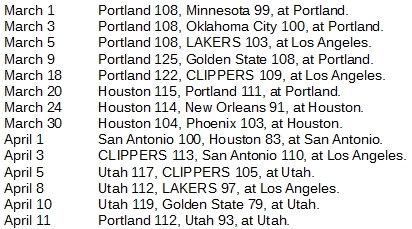 In third place are the San Antonio Spurs (20), followed by the Utah Jazz (16) and the Clippers (14). The Lakers are the only team yet to win the western traveler after three full years. They have only run into that chance four times, dropping all four games. 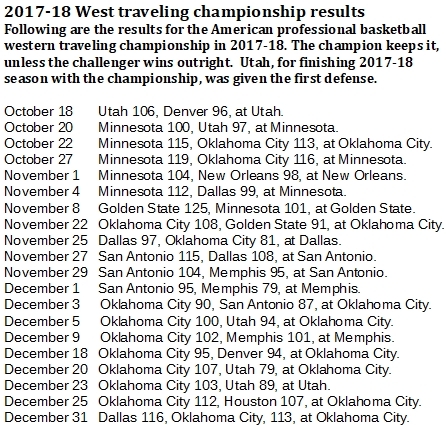 The Jazz were Team of the Year in 2017-18 with 12 wins, most in the West, and they didn't nearly maximize their opportunities, losing four title challenges. They book ended their season by carrying the title from 2016-17 and defending it once at the beginning, then producing a three-game title run in April. In between, their best moment came right before the All-Star break. 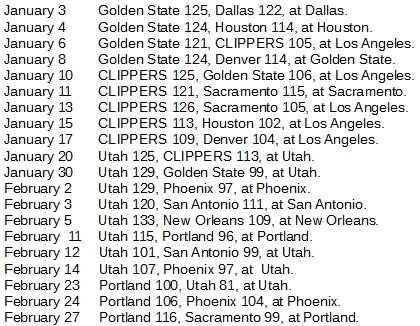 The Jazz won the title from the Clippers with a 125-113 decision at home on Jan. 20, then held on for seven more games until the midseason pause. On returning from the break, the Jazz lost the title, 100-81, at home against the Portland Trail Blazers.